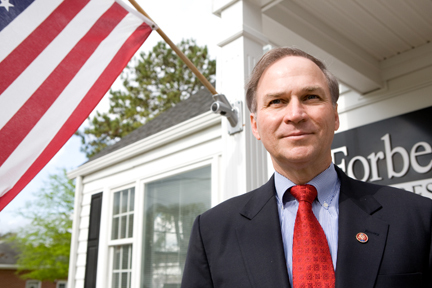 Congressman Randy Forbes on American exceptionalism. Congressman Randy Forbes from Virginia is certainly not among the most well-known members of congress, but he should be. He is a solid constitutional conservative and an excellent and eloquent speaker. A solid family man who defends family values and as a member of the Committee on Armed Services, he provides valuable oversight while tirelessly defending our men and women in uniform. Mr. Forbes has an understanding and respect for the founding principles of our nation along with a deep love of country. Mr. Forbes, in an Independence Day message to his constituents, highlights the exceptionalism of America and without naming him directly, cautions us of the danger to that exceptionalism posed by President Obama, who stated that America is not great and believes our nation is no different from other nations around us, a president who not only regrets the success of this nation but travels around the world apologizing for it! death – they built a revolution. They built America. those that believe our nation is no different from other nations around us. is the moment we will cease to be special. exceptional. And that exceptionalism is worth celebrating.